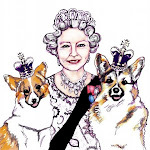 Sam Parr Art & Illustration: Blogging along nicely! I am starting to understand what blogging is all about (sort of), why it's worth having a blog, and enjoying having one! I used to write a diary when I was younger but once my mum found it, I was put off slightly, later in life at various points I enjoyed keeping brief notes of films I'd seen/meals cooked/daytrips/holiday diaries, and enjoyed looking back on that when I came across them a few years on. Very sporadically, for therapy really, through more emotional troubles I've written down my thoughts and feelings, but think I would look back in embarrassment (yet morbid fascination) at the person I had been. We do change through our lives, and some of those changes are for the better, I can vouch for that through the cringe-ability of old diaries! Hopefully I won't be writing anything TOO cringe worthy on here. Yesterday I recieved a really positive comment on my drawings etc that I have posted here and it was suggested that I had enough work for an exhibition, I had thought that the work wasn't polished, or current enough for that, but it has got me thinking about trying to organise one. Thank you to my friend for your positive comments, it is really good to get feedback. Good or bad in fact! Now I have to do some more work, and what I feel is hardest, is settling on a "style", I haven't really got one yet, I am dabbling in many different styles but not sure who "I" am yet. Alisdair Gray said he settled on his drawing style simply because he needed to work quickly to generate money. I hear that! Having no real income of my own at the moment. I think I want to have a light, clean, happy style, which will go down well for greetings cards etc. Some of the work I have here seems a bit dark for saying Happy Birthday! Perhaps I need to use a different picture for my header to that of the skull sketch I'm currently sporting. . .which puts me in mind of Hamlet. . . to be or what to be. . . that is the question. . . It's good to know what the artist is thinking or feeling - good,bad or ugly. Try again, try better (fail again . . . ) - the A Gray bit I mentioned was from a review of his new book `A Life in Pictures' which noted that the lines in his pictures were pleasingly simple, little shading and a lot of blank space - it is, he said, an "aesthetic rooted in the problem of needing to eearn your keep: "To paint steadily like Cezanne requires an unearned income". One solution, in lieu of a windfall, is to draw people "by swiftly putting a line round them" and making the background "look like skin with [the] surrounding colours and lines". "Ever tried. Ever failed. No matter. Try Again. Fail again. Fail better." Nice bit of Samuel Beckett there. I also like "We are all born mad. Some remain so." Not forgetting "What do I know of man's destiny? I could tell you more about radishes." That was Samuel not your friend Clement Freud, though he knew a thing or two about radishes didn't he? Thanks for the comment btw nice profile pic who did that for you? Currently in negotiations with pop group. . .